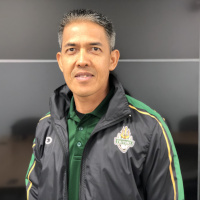 An alumnus of the University of Guam, Hidalgo received a Bachelor of Arts in Education with a concentration in physical education from UOG in 1994. Thirteen years later, Hidalgo earned a Masters of Science in exercise science from California University of Pennsylvania and with it the NASM–Performance Enhancement Specialist (PES) credential. He also holds the Asian Football Confederation “B” Coaching License. Last spring, Tipton served as the interim coach for a Triton Men's Basketball team that returned to the court for the first time in 15 years competing in the FIBA-sanctioned Guam Basketball Association last spring. The team, composed of all walk-on players, finished with two wins and 10 losses. Tipton earned a B.S. in Physical Education from Northland International University in Dunbar, Wisconsin in 2008, and holds a International Basketball Federation (FIBA) level one coaching certification. He is also a candidate in the FIBA Europe Coaching Certificate program and works with The Basketball Embassy, an international organization that helps to develop European national basketball programs through working with youth.